The Brendan Moore Advocacy Center and the Brendan Moore Advocates Program were established to foster the teaching and study of lawyers as trial advocates. The Center was made possible through the generosity of Thomas A. Moore '72 in memory of his brother, Brendan Moore. Fordham University School of Law “in the heart of New York City” takes “a seriously practical approach” to the study of law, and “The breadth of the programs” here is paralleled at few other places. Students laud the excellent and thorough legal writing program. Fordham Law also does a really good job in taking advantage of its location “through courses involving fieldwork,” externships, judicial placements, and various extracurricular events. “A large selection of clinics” includes some very unique opportu­nities in international law, and Fordham “will fund students’ trips abroad to engage in human rights work.” There are several more meat-and-potatoes offerings, such as family law, federal litigation, and housing rights as well. As befits its Jesuit heritage, Fordham is also very big on public interest law. “A crackerjack team of public interest minds” is willing and able to help students start service projects or find meaningful ways to make the world a better place.While a few professors are “awful beyond belief,” the faculty is mostly filled with “a cross section of bright and charismatic teachers”—“some of the most brilliant minds cur­rently teaching the law.” They’re “incredibly candid,” “witty,” and “engaging in the classroom.” The faculty interacts with students “out of the classroom,” as well. Sadly, dealing with Fordham’s bureaucracy is a wholly different story. The "shaky," "disorga­nized" administration is generally disliked. “It works out for those of us who cannot get anything in on time,” notes an upbeat 1L. “There is no way they would ever notice.”It’s a perennial lament among students here that their school is “extremely underrat­ed” and “would be ranked higher” if only New York University and Columbia weren’t each a few subway stops away. Fordham Law boasts a “particularly strong” and loyal alumni network, though, and the school is located in “one of the best locations in Manhattan,” within walking distance to several of the world’s biggest and most revered white-shoe law firms. Students also tell us that Fordham has a reputation for producing “exceptionally hardworking, occasionally pugilistic (figuratively), and bright” lawyers. Average starting salaries are quite comfortable and employment prospects are pretty good if you can manage a solid class rank. “With good enough grades—at least top third of the class—you can snag a big law job if you want,” relates a 2L.The research facilities are great at Fordham, and the librarians are “incredibly helpful,” but students have few other good things to say about the accommodations. The “cramped,” “crowded,” “decrepit,” and generally “inadequate” building “feels more like a 1950s fallout shelter than a law school.” Luckily, “Its days are numbered.” There’s a new building in the works, and “The design is striking.” The space concerns and depressing architecture of this drab concrete cinderblock “will no longer be an issue” once the new law school building is completed. 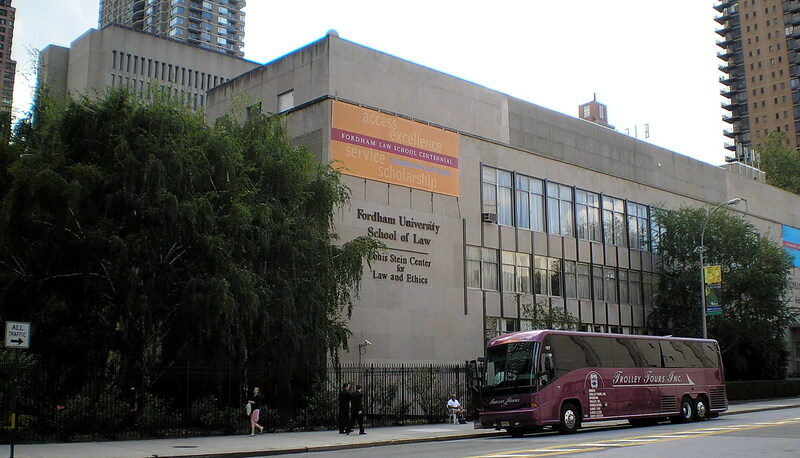 Want more info about Fordham University School of Law? Get free advice from education experts and Noodle community members. How much is the average rental cost for a 2-bed apartment rented by Fordham University Law School students? To learn more about rental prices I suggest first checking a designated classified site like Craigslist. Fordham recommends consulting the billboard located within the main stairwell of the law school, or visiting Places 4 Students.